Subaru Telescope, using Suprime-Cam, took the clearest most complete image to date of the spiral galaxy NGC 2403. At a distance of 10 million light years, NGC 2403 is an Sc type galaxy, which has open spiral arms and a small nucleus. It is approximately half the mass of our own galaxy, the Milky Way, and has an abundance of neutral hydrogen gas. In the spiral arms we see active star formation regions in red, clusters of young blue stars called OB associations, and darker regions called dust lanes where light is blocked by gas and dust within the galaxy. This is not the first time NGC 2403 has been studied. Edwin Hubble used NGC 2403 as evidence that more distant galaxies move more quickly away from us, now called Hubble's Law. It was also used to develop the Tully-Fisher relation, which states that there is a relation between a galaxy's rotational speed and its brightness. NGC 2403 has become an important standard galaxy when deciding the distances to other galaxies, as we recognize the vast expanse of space. Larger galaxies are thought to have developed from the collision and merger of smaller galaxies. Mergers can leave enduring marks on a galaxy's halo, the most extended and generally spherical component of a galaxy. There is evidence that relatively young stars exist in the halo of NGC 2403, hinting at a recent merger with another galaxy. 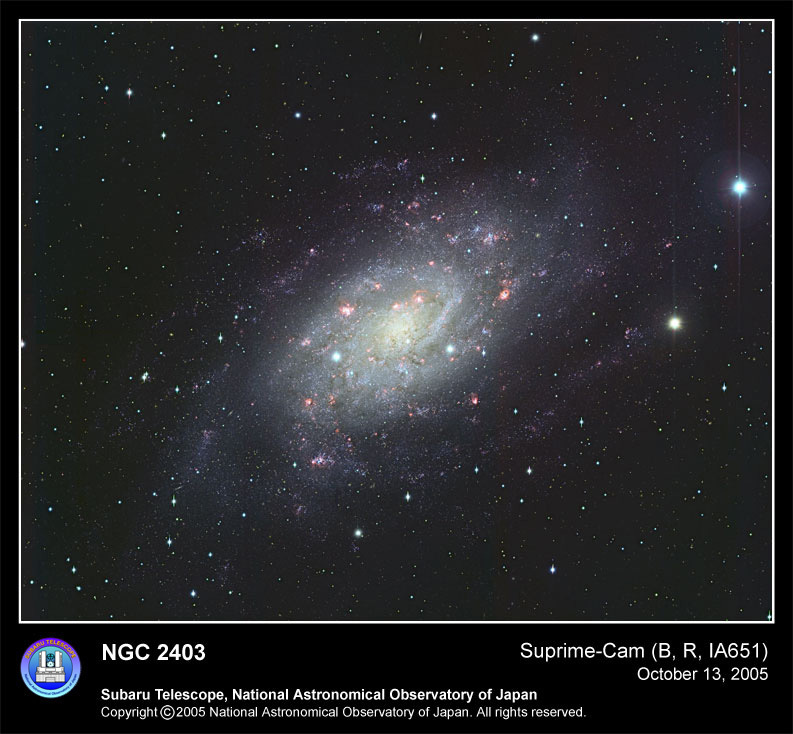 Astronomers are now studying this image to see if the color and brightness of the stars in the halo of NGC 2403 will reveal conclusive evidence of past mergers.